This image comes from Kanaka on Flickr. 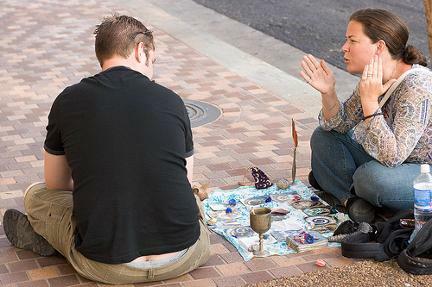 Many people these days are seeking the advice and foresight of psychics the world over. And just like any other industry out there on the internet, the psychic industry is full of scam artists and thieves who are looking to take advantage of those people who are not being as vigilant as they should. So, how do we avoid being scammed while looking for a legitimate psychic? The most important thing that you can do in this and any situation is simple. Use common sense. We all have it, but most of us tend to ignore it. If we would just pay more attention to the details we could avoid a lot of trouble in our lives. Most scam artists in this industry are trying to make money by telling you what you want to hear. They will charge you a large fee for things like the winning lottery numbers for this week. Think about that for a moment. If they knew the winning numbers, then why have they not won the lottery themselves and make all the money that they would need? Always ask yourself the question, "Does this make sense?". If not, then it is probably a scam. Also never give out your personal information. I have seen scam artists in this field ask for everything from credit card numbers to the name of the family pet to social security numbers. Only make your payments through secure means, like PayPal, where if you find that you have been scammed then you can more easily get your money back. A legitimate psychic will never ask for this information. Before you decide on your psychic, always make sure that you read reviews and feedback on that person or business. Yelp is a great tool to look up some people, and if you cannot find them there, you can always Google them and see what comes up. If nothing comes up, that is a red flag and you should choose someone else, and the same goes for if you see a lot of negative reviews. In closing, always make sure that you do your research fully. There are a ton of good, legitimate psychics on the web out there, but it only takes one bad one to ruin your day. Use common sense, do your research, and always trust your instincts. Remember,if it sounds too good, it probably is.